Our first year. The MS Society didn't realize Jenifer spelled her name with 1 "n", but they learned quickly. Please join us as we celebrate 20 years as a team. Yes, we are celebrating the hundreds of thousands of dollars we have raised while supporting our friend and family member, Jenifer Walsh. In 1998, Jenifer was diagnosed with multiple sclerosis. 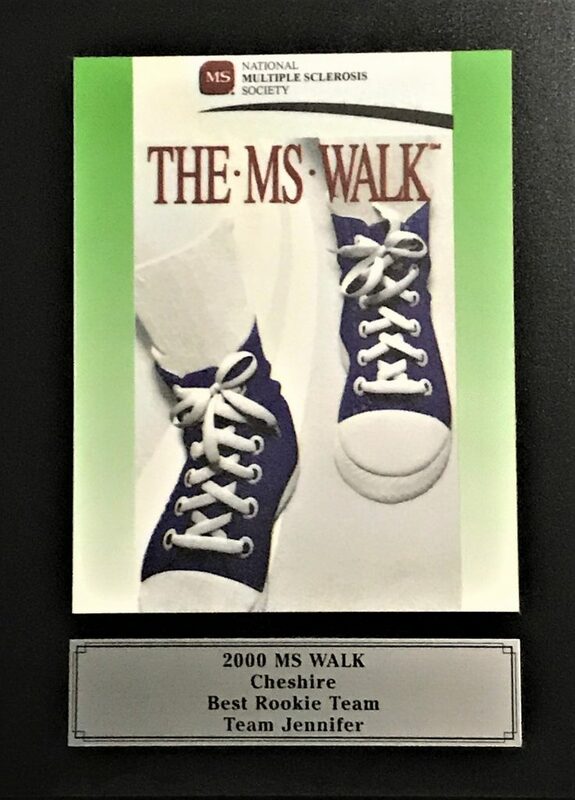 In 1999, Jenifer, Cara and I walked in our first MS Walk. (Patrick wasn't born until December of 2000). In 2000, we formed Team Jenifer and the rest is history. We are asking as many of you as possible to please join us on May 5 and walk to support Jenifer and the thousands of others affected by MS. We are also challenging you to bring a monetary donation so we can show how strong our team is not only in numbers but financially. We look forward to seeing you all on the 5th! 23 years ago, Jenifer ran a 20K road race in 2 hours, biked in several of the 50 mile MS Bike Tours, and golfed. When she was diagnosed with MS 21 years ago,I knew she wouldn't let that stop her from being active. She just had to find what she could do with her abilities. She found it in spinning! As she works hard to get back on the bike, lets remember the strength and determination she needs to achieve the goal of teaching another Spin class. I encourage all of you to join us in a show of support and celebrate Team Jenifer and the over $370,000 we have raised to date. Join us at Cheshire High School on May 5th and support Jenifer and the other thousands of people diagnosed with MS in Connecticut. This is why we walk, so people like Jenifer know they aren't alone in this battle. 2 months from a third knee replacement and nothing is slowing her down. Please support Team Jenifer ant our 20th year as a tem at WalkMS on May 5! !